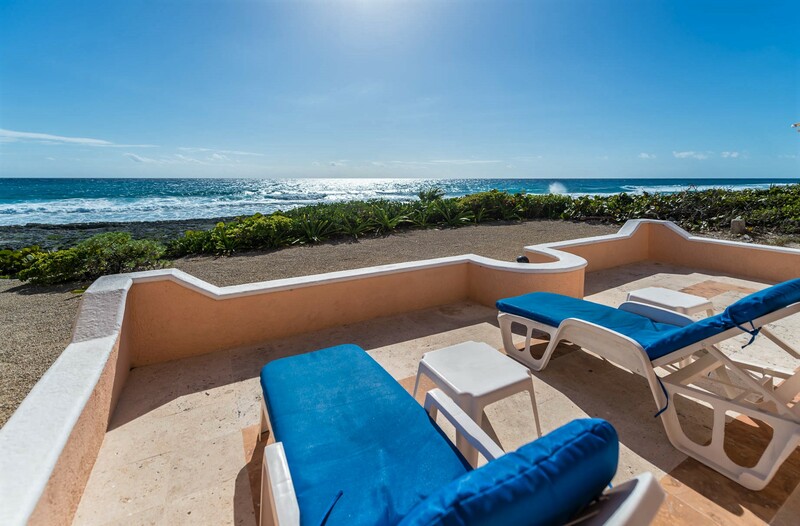 Exterior Ocean side Casa del Mar and our sister villa Nicte Ha Exterior Exterior Exterior Exterior Exterior Akumal Sunrise! Exterior 4 Sun loungers pool side. Exterior Exterior Sun loungers ocean side. Morning sun, late afternoon shade. Outdoor dining table for 4. Exterior Exterior View from rooftop observatory. Dawn at Casa del Mar Casa del Mar ocean side. Splash! Sunrise Your housekeeper at Casa del Mar. Mary Cat Dzul. Casa del Mar entry buffet Living area Casa del Mar living room Casa del Mar Dining and Living Area Comfortable and new seating Dining area at dawn. Dining area seating 6 guests. Fully equipped kitchen. Purified water provided. Full kitchen Full kitchen, gas stove/oven with microwave. New, sharp knives Fully Equipped Kitchen Cheers! Kitchen bar seating 3. Main level King Bedroom opening to the pool deck. Main living area bathroom with shower Main level king bedroom with brand new Sealy pillow top mattress Main level kin bedroom with A/C. Welcome to Akumal! Master bedroom with private bath and balcony with hammock. Casa del Mar master bedroom Casa del Mar master bedroom Master bedroom balcony. Master bedroom with sunrise oriented ocean view. Lending library and en suite master bath with shower. Beach towels are provided. Please take a book home if you are reading it before departure. Upper Third bedroom with double, single bed and large private ba Upper guest bedroom with double and single bed. A/C and large s Interior Upper level guest bath. 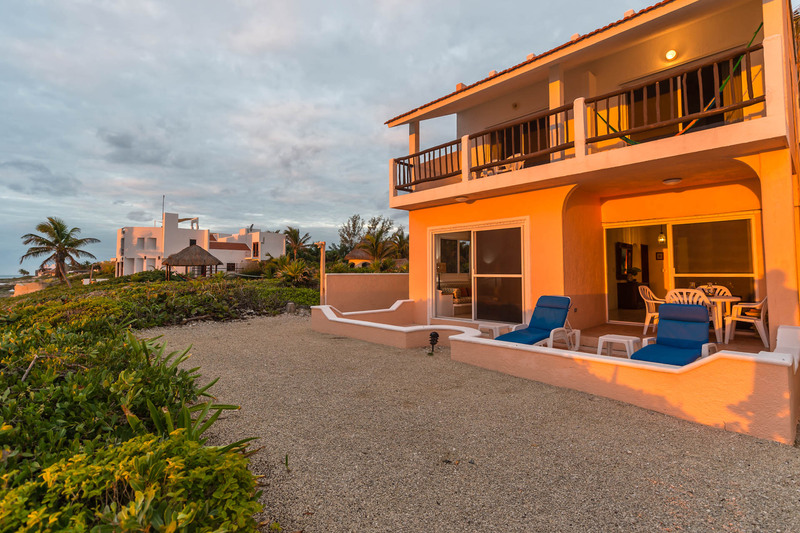 Centrally located between Akumal Bay beach and Half Moon Bay beach, Casa del Mar is a comfortable 3 bedroom, 3 bath home that accommodates 7 people. 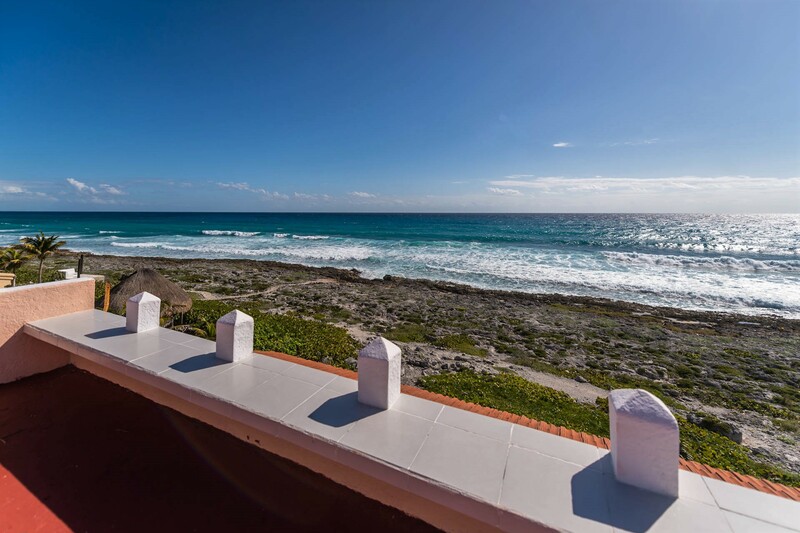 For larger groups up to 10 we recommend that you reserve Casa del Mar and Nicte Ha (located next door) together. Special rental rates may apply when both houses are rented together. 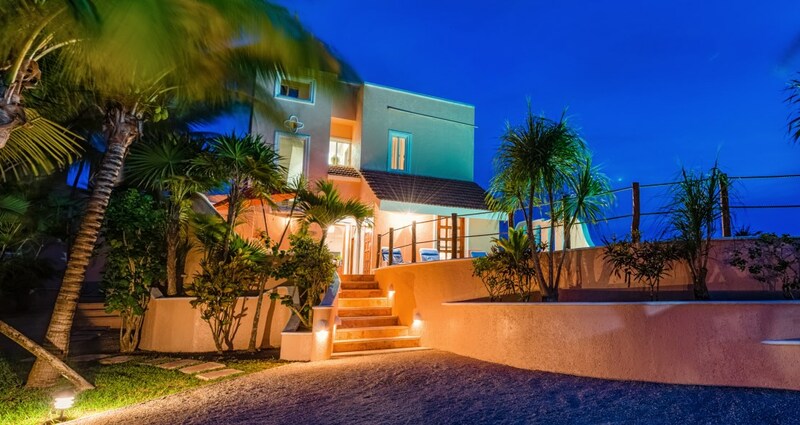 Casa del Mar's main living area with view of the Caribbean features a full kitchen , living and dining area with Smart TV for Netflix, SAT and WIFI. The master bedroom is on the upper level with king bed, en suite bath and air conditioning. 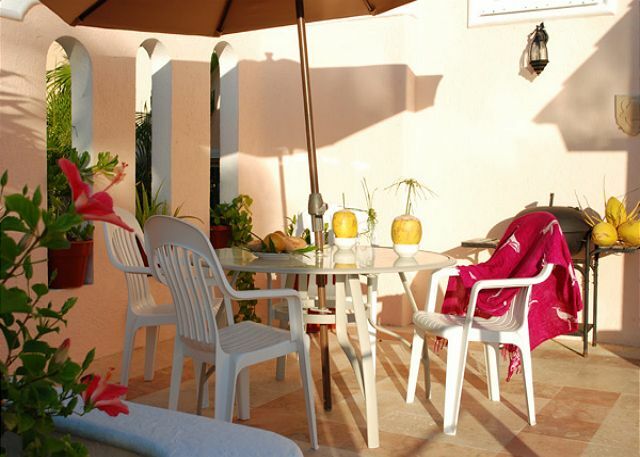 The room is very spacious with a nice ocean side terrace furnished with a hammock and patio furniture for you to enjoy. Also on the upper level is a smaller garden facing bedroom with air conditioning which is perfect for children. This bedroom is furnished with one single and one double bed. There is a large private bath with shower and a security safe. The lower king bedroom has a door leading to the garden side pool deck. There you will find sun loungers for you to enjoy, as well as a patio table for dining and a charcoal grill. The lower bedroom bath is shared with the living area. This home has AC in the bedrooms only. The main living area catches a fabulous sea breeze. Rates are in US Dollars. Rates subject to change without notice. In some ways, this rental villa looked too good to be true but we took a chance and prepared ourselves to laugh about any deficiencies. After all, we love Akumal so we were going to have a great vacation regardless. Upon our arrival and walking through the front door after a day of travel, we could not have been more pleased. Casa Del Mar is amazing. The house is perfectly located walking distance between the town center and many great spots on the North Road. Walk in either direction and you will find lovely spots to spend your days which fly by all too quickly. 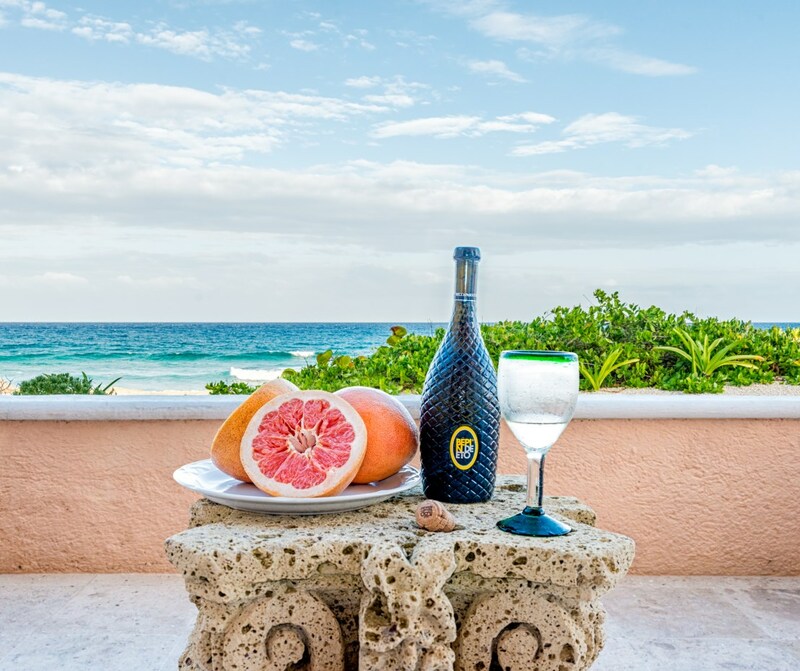 Head North and you'll find Buena Vida where you can dine on the beach under palm trees or a bit further to La Lunita for a more upscale dining experience. Head South and you'll be in Akumal Centro in 7 minutes where we relaxed, ate some more, and enjoyed a week of incredible diving. Mari, the housekeeper came every day except Sunday and ensured that the house was immaculate whenever we returned from our days adventures. Roberto (grounds keeper) was also friendly and fantastic going so far as to wash our rental car on our day of departure which was above and beyond. While we didn't feel it necessary, Casa Del Mar comes with a security guard who patrolled the property at night which I guess would provide peace of mind if you are concerned about personal safety. Some of the decor in the house is slightly dated and it is situated on a somewhat rocky shoreline but this was all clear from the photos on the listing which really are perfectly accurate. With that said, Casa Del Mar was immaculately clean, everything was in perfect working order, and we felt at home almost immediately. We're going to decompress after this wonderful trip and fantastic stay is Casa Del Mar, but word on the street in our family is that Thanksgiving at Casa Del Mar will become a tradition. Thank you for an amazing stay! "We loved our stay and were so sad to leave!" 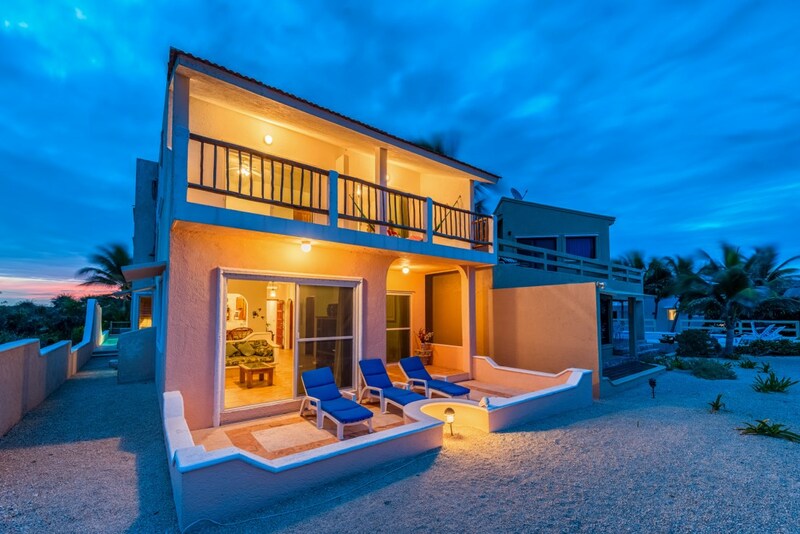 We absolutely loved Casa del Mar, it was a perfect holiday home for our young family (kids 1 and 3 years old). Very clean, charming house with a beautiful view and a gorgeous pool. Amazing staff, especially Roberto who helped us with all our requests. Wonderful location close enough to town to walk, but recommend a car for getting around and seeing local cenotes, ruins etc. Akumal is a charming town for families, highly recommend. Awesome place! Great location, very safe and inviting. Quiet and safe. 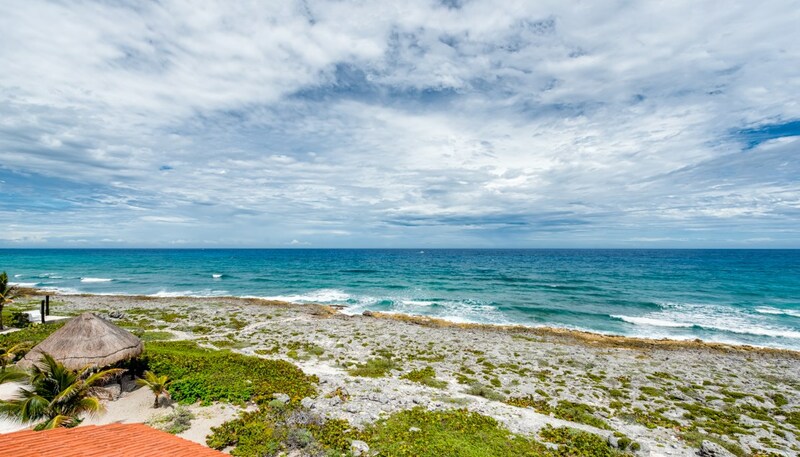 You have a grounds keeper that is available to help out, and this comfy place includes daily housekeeping service and fresh beach and shower towels as needed. Lovely view for sunrise and right on the coastline. It's a bit rocky so swimming is just a few minutes to the public beach next to Akumal Dive Shop. Well stocked for making family meals. 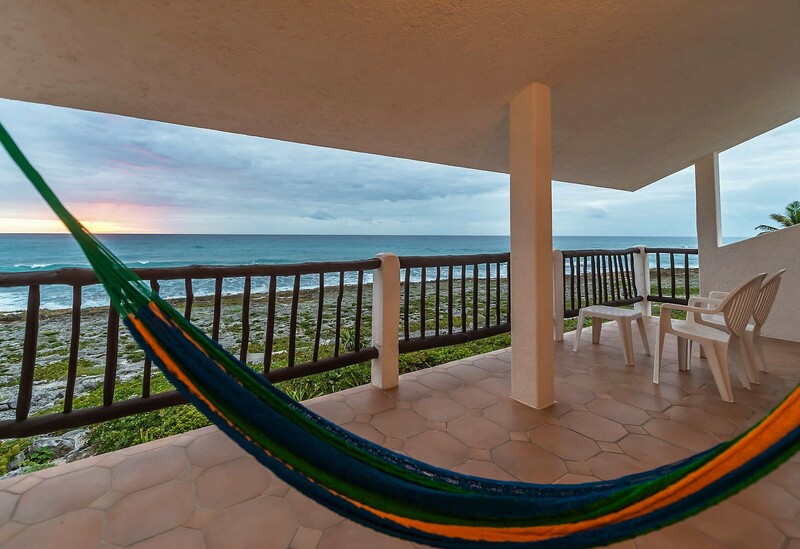 Enjoy the hammocks on the balcony for a nice evening breeze and sunset. We checked out some beaches down by Tulum and your local Akumal beach is definitely nicer with a great restaurant Loh ha (if you go through the Akumal hotel lobby to the restaurant, you can save the beach entrance fee). You also have Buena Vida restaurant within minutes that has great beach atmosphere with some fun swings as seats. All in all, great service and pretty much everything you need to relax. Yes, that does sound like an exaggeration, but lounging on one of the comfortable chairs at Casa del Mar with a perfect view of the beautiful bay, one can forget one's troubles for a while. This place is comfortable in every aspect. The decor is charming, the kitchen is large enough to actually do some cooking and the seating arrangement is perfect. The formal dining table makes it possible to serve a special dinner while viewing that beautiful blue water. The bedrooms are spacious and the beds comfortable. The bathrooms are quite adequate with some really good hot water to relax you even more. To add to all that, there is a fine pool which is deep enough to actually do some swimming. 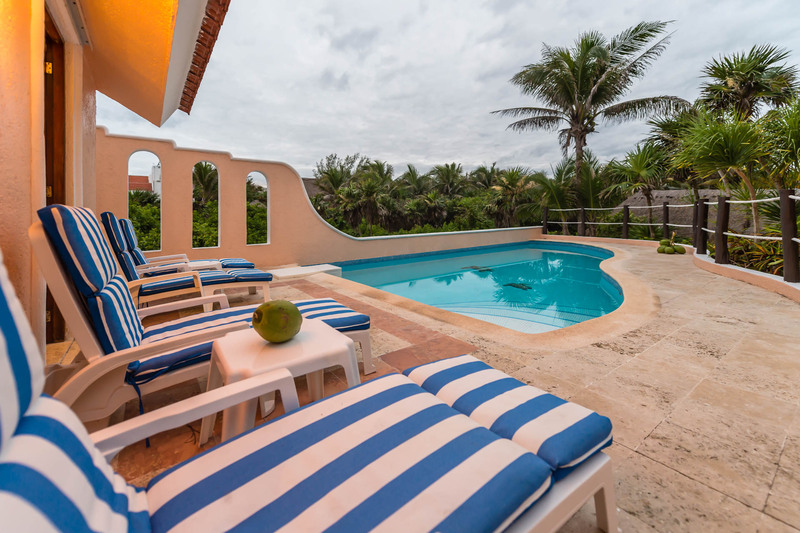 Or, if you don't feel athletic, you can just relax in one of the beach chairs and enjoy the view of the coconut palms and surrounding vegetation. Lovely time at Casa Del Mar, the quintessential beach house in stunning Akumal. The beds were comfortable, the kitchen well-equipped, the wifi was strong, hot water, all the amenities were provided. 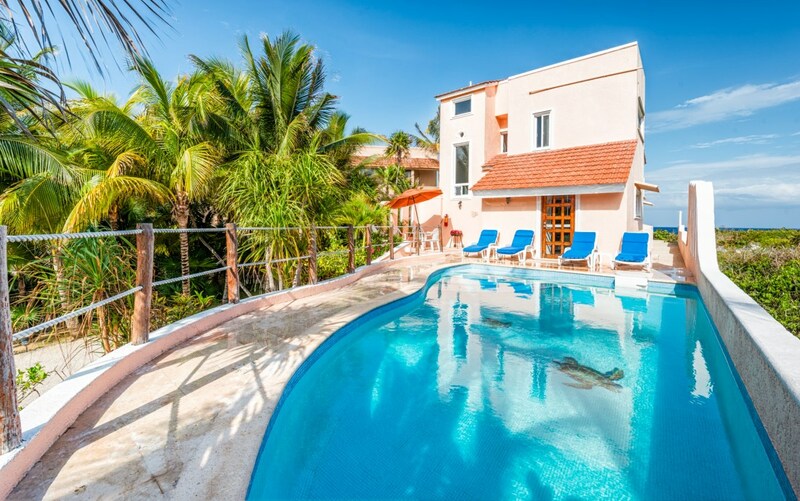 Within walking distance to some nice restaurants, including La Buena Vida to the north, and the "downtown" Akumal area to the south. Loved the balcony off the upstairs master--saw a rainbow two nights in a row. The pool was a nice touch, perfect for a cool down. All in all, this is a great place to bring your family or a group of friends. Would stay here again! 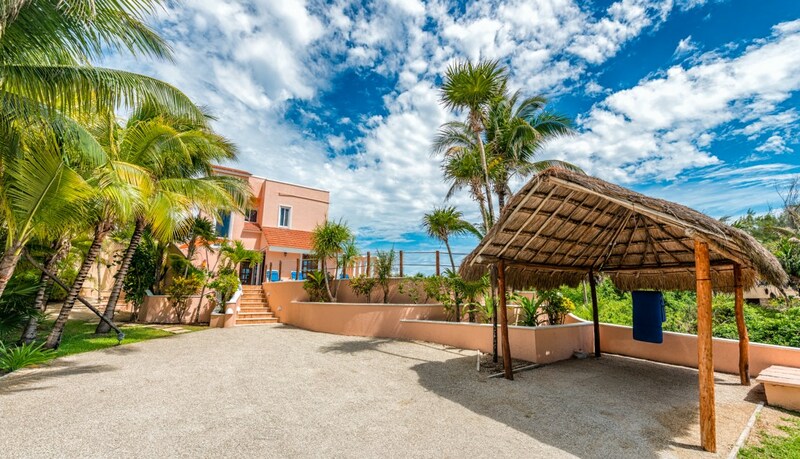 Casa del Mar is a very colorful and comfortable house in the middle of Akumal. 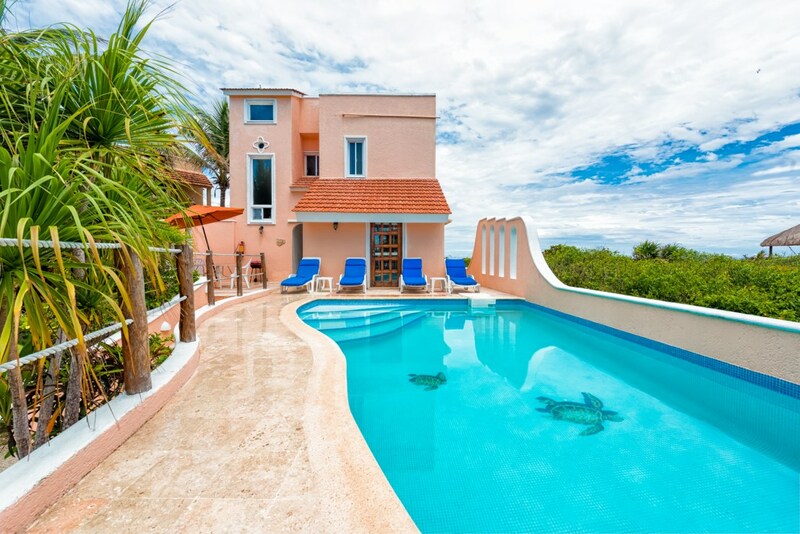 It offers great view of the ocean, and the pool is very cute with turtles on the floor and view of the sunset. Very nice to jump in during the day to refresh and at night. The room are comfortable with the master bedroom with a great view of the ocean, and with nice hammock to hand around and relax. The chicken is great with plenty of supplies for cooking and the A/C are working well. 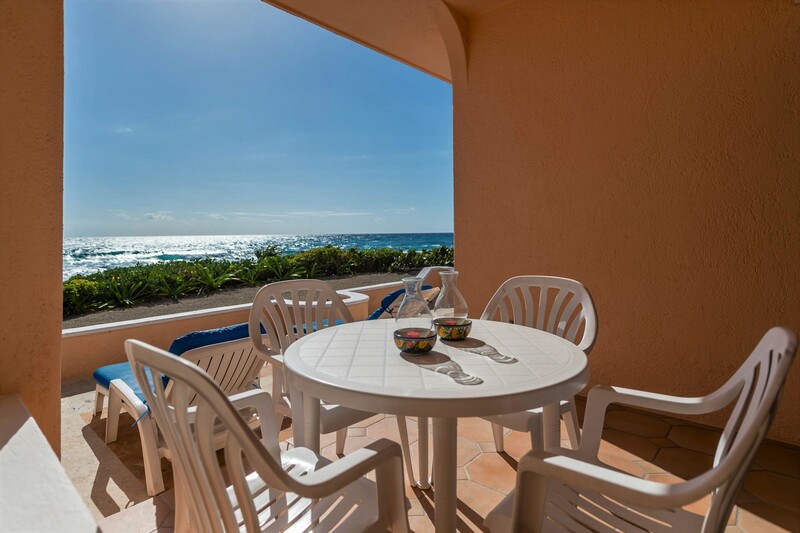 Very close to restaurants like Akumal Bakery, Buena Vida, and a short distance to the more local restaurant on the other side of the road. 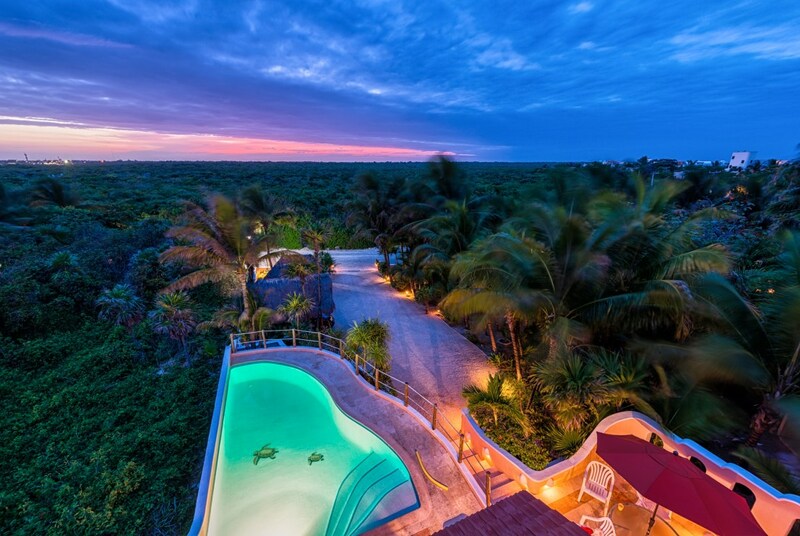 All in all a great place to stay, and enjoy what Akumal has to offer. Back here for year #2 and as I mentioned last time, we bumped up our stay to two weeks. Not much has changed with the house so I won't go into the same details again. The grounds are still beautiful, the house is still the perfect size for a small group or family. Having our own pool is such a huge plus. Mari the maid was friendly as ever and did a great job keeping the house tidy. I believe sheets were changed twice a week and towels were changed out whenever we left them on the floor. We took her up on the offer to do laundry this year, which was great. We could have got by with packing much less. We left a note and some Pesos next to the laundry basket in the morning and both loads were washing, dried, and folded when we returned in the afternoon. 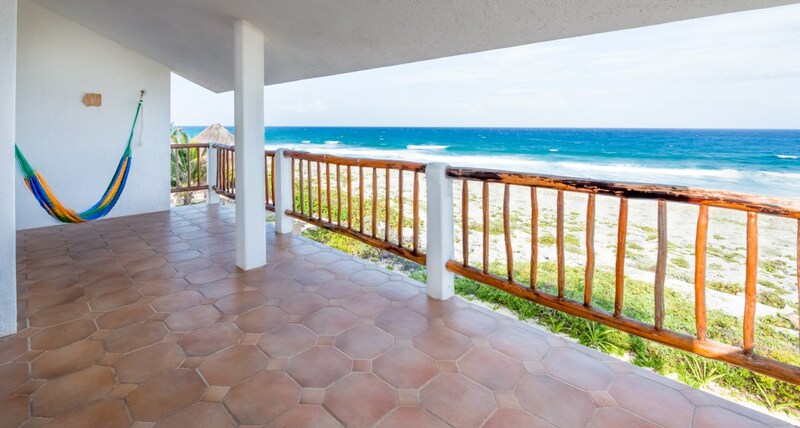 The location is ideal for getting to either beach, it is close to restaurants, and attractions, and if you're able-bodied, it's an easy walk to the Pueblo for a meal or to the highway to catch a colectivo. If you decide to rent a car, there is a nice covered carport so you don't have to worry about it sitting in the hot sun or catching a falling coconut. One thing we really enjoyed was shutting off all of the air conditioners and opening up every single window. That's how paradise is supposed to be enjoyed, not with the windows closed and A/C cranked up. Booking with Marcia at Akumal Direct Reservations was smooth and she is extremely easy to reach if you have any questions. We would definitely stay here again when we return to Akumal next. We thoroughly enjoyed our stay at Casa del Mar this November. The house was kept spotless (inside and out) and was very well-equipped. All the staff were extremely helpful and accommodating. The beds were comfortable and the view was spectacular. 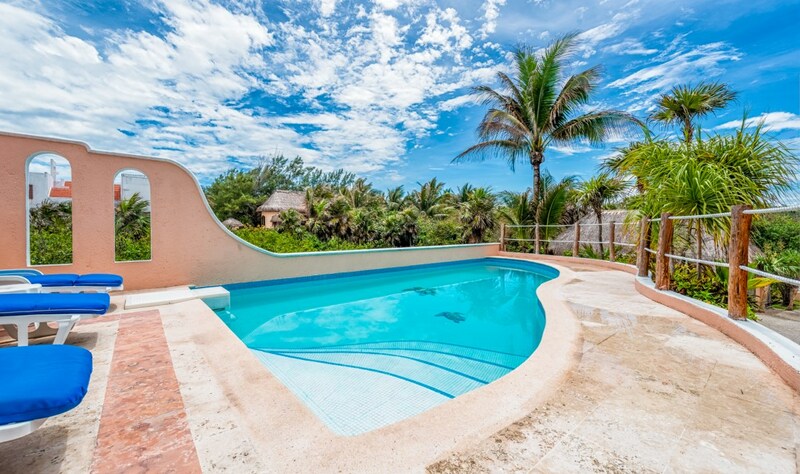 We also thought the location was great-a 10 min walk to Akumal beach/town and the same to Half Moon. La Buena Vida and Turtle Bay bakery/cafe were two of our favorite restaurants. It was very useful to have a car to explore and to get to bigger and less expensive supermarkets. The only negative (other than the fact that we're not there right now) would be that some of the screened sliders were a bit worse for wear. We will hopefully return soon.